Nearing its 50th year, ISACA (isaca.org) is a global association helping individuals and enterprises achieve the positive potential of technology. Today’s world is powered by technology, and ISACA equips professionals with the knowledge, credentials, education and community to advance their careers and transform their organizations. ISACA leverages the expertise of its half-million engaged professionals in information and cyber security, governance, assurance, risk and innovation, as well as its enterprise performance subsidiary, CMMI Institute, to help advance innovation through technology. ISACA has a presence in more than 188 countries, including more than 220 chapters and offices in both the United States and China. 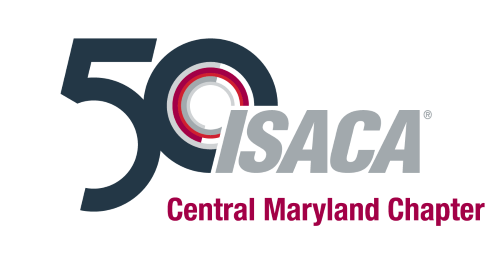 ISACA Central Maryland Chapter (CMC) is one of the more than 220 ISACA chapters established in over 188 countries worldwide. ISACA-CMC is a sponsor of local educational seminars, workshops, monthly training events and networking opportunities. Our goal is to help further promote and elevate the visibility of the IS audit, control and security profession throughout Maryland and local commuting area. ISACA-CMC is led by a group of dedicated volunteers offering IT, information systems, security, audit and financial professionals local educational events, resource sharing, advocacy, professional networking and a host of other benefits at the local level. During its fiscal years July 1st to June 30th, ISACA-CMC offers a monthly training event with 3 to 7 CPEs from September to May and one to two 2-3 day seminars during the spring and fall seasons. Unless otherwise stated, member prices for these training events are available for all ISACA, and local ISSA, AGA, IIA, and CFE members. In addition, retirees qualify for member prices. ISACA-CMC is a resource that enhances member skills, expands their professional knowledge, and connects them with a vibrant community of peers. Volunteers are ISACA members nominated in April each year and elected through the ISACA-CMC Annual General Meeting (AGM) held in May each year. Volunteers are highly encouraged to participate and assist with chapter activities. ISACA-CMC is a chapter of ISACA. ISACA, incorporated in 1969, is a world-wide association of IS governance professionals. It was previously known as the Information Systems Audit and Control Association with its roots as the EDP Auditors Association. The association currently focuses on assurance, security, and governance. The COBIT framework and following four certifications are globally accepted and recognized ISACA brands that result in greater trust in, and value from, information systems.